With today being Haute Whimsy's 4th birthday, I thought it would be nice to do a little giveaway for one of my crystal-laced prints. 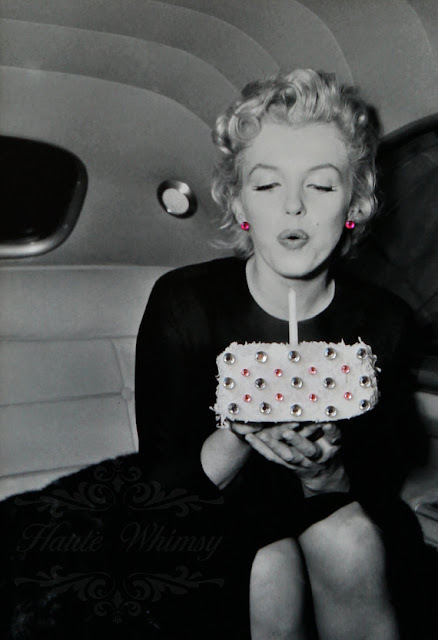 Keeping with the theme, the winner will receive the above 5x7 Marilyn Monroe: Happy Birthday print matted in an 8x10 black mat. For a chance to win, please hop on over to the Haute Whimsy Etsy shop and leave a comment below letting me know if there are any other prints that you like :) If you don't find anything that strikes your fancy, let me know which actor or actress would bring a smile to your face! I favorited your etsy shop (shadowsarah). I follow you on pinterest (snllama). I liked on facebook (Sarah LaMantia). I love Mae West: Don't Threaten Me with a Good Time & Springtime Marilyn. The Marilyn Monroe: The Photographer print is super cute! I love the Elizabeth Taylor (Cleopatra). It's stunning! I have say I love any thing Audrey Hepburn but I would have to say that my favorite thing is the Marilyn Monroe you show here. AND now I'm following you on twitter! I like the Mae West print. I LOVE the one of Doris Day! I like the fire cottonweed print. Thanks! Thank you for the contest. I love this print!!! HAPPY 4TH BIRTHDAY! I like your Julie Andrews: Swan Princess print! I love these "enhanced" photos. I love the Audrey Hepburn one, although I really wish you had a Grace Kelly one! I follow you with GFC- Taylor Louise. I love the Audrey H! i would love Marilyn Monroe: The Photographer, but i would LOVE to see a Grace Kelly one. I favorite Haute Whimsey at esty. I do have some questions for you if it's allright. Could it be just me or does it appear like some of the comments appear like coming from brain dead people? :-P And, if you are posting on other online social sites, I would like to keep up with anything new you have to post. Could you make a list of all of your community sites like your linkedin profile, Facebook page or twitter feed?